A decade and a half ago, I would have never predicted the life I have today…no way! When I first picked up some oil paints a little over a decade ago, I had no art training, having dropped the idea of an art degree, at the eleventh hour, to pursue “more academic” subjects. Yet what looked like a total catastrophe in my life when my health crashed turned out to be a rebirth once I found myself painting, creating and writing full-time as well as truly relishing life at a slower pace and in a way that so many people seem to wish they could but don’t. Would I have done this had my health not crashed? To be honest, I doubt I would have stopped until I retired. A big part of my inspiration to write what I do in this space is to convey to people how these life recalibrations are not only possible and desirable but that they are essential to gain the fullest sense of who we are and what we came here to experience (and when we “go off the track” of our blueprint, life has this way of nudging us back on course). Before my health took a nose dive, I gained a degree in English Literature, did a variety of jobs, including project managing exhibitions (other people’s designs…just not mine) and ran a handful of computer-based and editorial businesses from home before going to work in a corporate solicitor’s office handling well over 200 personal injury clients. Though I painted some sort of idea of a prosperous and safe future in my head, I had no real sense of what I wanted to do or where I was going and was deeply unfulfilled, unhappy and stressed in a way that I denied, even to myself though, really, I was at burn-out point. To put this blog into context, here’s my reinvented “career” since life pulled that old rug from under me and presented me with new opportunities. To this day, I have no real idea where I am headed but, unlike that “me” of a decade ago, who would have found the not knowing deeply unnerving, I now find it invigorating since the “picture” of my life has never been more colourful or full of latent potential. Self-taught in the use of oils, the paints found me when they fell out of a cupboard in 2006 and using them came naturally from the start…as therapy, of sorts. Within two years, following a bizarre and entirely chance conversation, I was invited to exhibit a collection of my work in a prestigious Hampshire gallery…one which felt way out of my league but they apparently didn’t think so… and thus began a full-time art career. My paintings have now been exhibited in galleries across the UK, in London and New York, plus many group exhibitions, art trails and charity events. They are held in private collections all around the world and hung on the walls of the kind of places that people go to be healed due to the “healing energy” and “sense of peace” they have been found to contain. Dealing direct with my growing customer base is something I particularly relish since I enjoy watching my paintings “accidentally” find their way home with exactly the right person which is something they have a knack of doing. With that in mind, I encourage you to contact me directly as a starting point to owning a piece of my art. It’s fair to say that art has transformed my life and, in 2013, I accepted an invitation to publish an account of my art-and health-recovery journey in a collection of autobiographical stories as part of a best-selling series of inspirational books that includes contributions from the likes of Marianne Williamson and other self-help veterans. In 2014 and 2015, I received no less than four American Art Awards in this annual event juried by a selection of top US galleries and which receives many hundred of entries from over 50 countries. 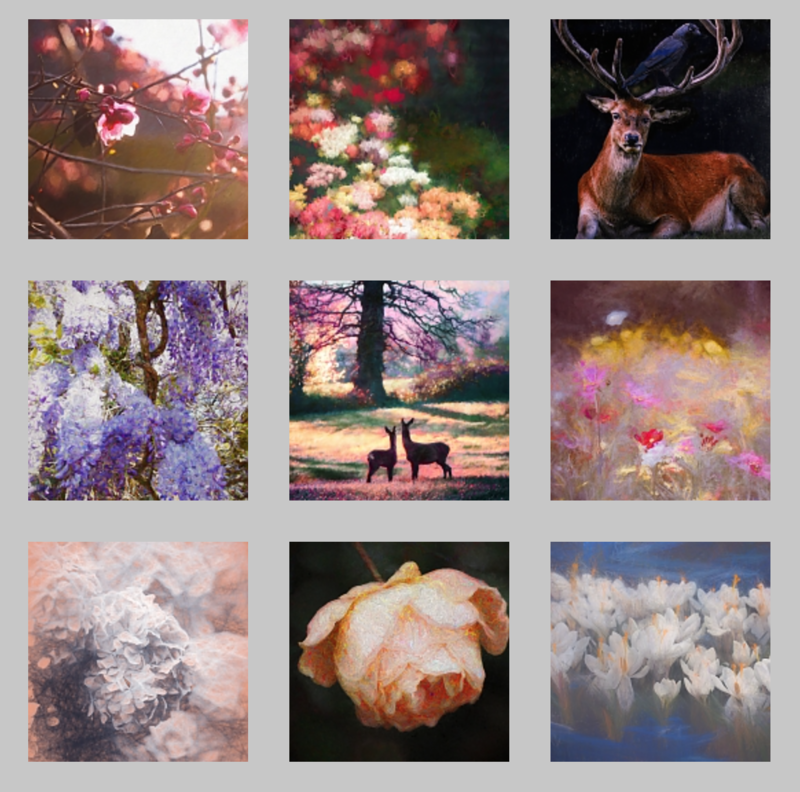 I have been represented by Bridgeman Images for a number of years via whom my artworks are available to license. Since 2017, I have been putting together an exclusive collection of fabric designs for VIDA who create stunning art-inspired fashion accessories and clothing using silk, cashmere and other so-beautiful fabrics whilst empowering their employees with education programs related to literacy, women’s rights, personal finance and so much more. You can watch a video about their inspiring efforts to support both artists and manufacturers here. My work is diverse but my core subject is “light” or, more particularly, those moments of intense radiance that are as transformative as they are fleeting. Colours are vibrant and bold yet there is a subtle energetic quality that has been commented upon numerous times. People have described my work as ‘healing’, ‘mesmerizing’ and ‘like a portal into another dimension’. The latter is a quote from world-famous energy intuitive Lee Harris, who purchased one of my paintings. Both my subject matter and my style are open to continuous evolution in a journey that feeds a passion for painting that never grows stale. Alongside my eventful journey as a self-taught artist, I have been on a parallel one – towards health or “wholeness”, as a recoveree from fibromyalgia and myofascial pain syndrome. At the same time as pursuing this return to health after fibromyalgia ‘happened’ to me, back in 2005, I started to spend much more time walking in nature, noticing how being outside, where my preoccupation became photographing moments of intense light, accelerated my recovery process, however lousy my body happened to feeling when I set off on these daily jaunts. As I traveled further along this road, sampling various healing modalities and learning how to expand my own awareness in order to assist my own recovery, I became increasingly conscious that energy is absolutely everything. That is, thoughts and intentions are energy, objects are (slower moving) energy, we all exist as part of an energetic universe in which all things are intricately connected by energy; something my journey back towards health and wholeness demonstrated to me, over and over again, in many countless ways. When we ‘see’ something, there is so much more going on that what our eyes take in and, when an artist paints their intention, they energetically connect with the viewer as well as connecting that viewer with an aspect of whatever it is that inspired them to create. I discovered that when that inspiration came in the form of a light-infused subject, a moment of intense radiance, an experience of time seeming to stand still in the glow of its own serenity, those experiences could be felt through the artwork and could be transformative or even healing. I discovered also that subjects such as these hold a particular vibration, a frequency, that can be felt by others and which can uplift them or even activate their own positive experience. This is conveyed through a visual language that relies on balance, beauty and light, visual cues that we all know how to read because they are already ‘out there’ in nature, instinctively read by us from the moment we are born and capable of lifting our souls whenever we choose to tune into them. As such, the visual arts are able to tap into the broadest ‘unseen’ realms of experience using what is visible as a prompt to the eyes, a reminder that activates memory and healing. If my own experiences are to be believed then, at the very core of this shared universal ‘language’ of wellbeing and healing is “light”; the most central preoccupation of my art. If my crashing health had felt like an experience of fragmentation, of profound disintegration, then moments of light intensity seemed to serve as a reminder of the very return to ‘wholeness’ that I sought. Even before I noticed the theme, my work started to look like an unconscious exploration of this motif of a journey back towards unity, typically conveyed as moments of supreme intensity and radiance (my earliest subjects were mist, fog and rather moody landscapes but, in parallel with my healing progress, I moved on to where I was suddenly painting explosive sunsets and then moments of gentle radiance “being let in” through windows…). It began to occur to me, through my painting mediation, that sunsets represented to me that moment when all the diverse colour and contrast, the hard lines and structure of physicality begin to soften and fragment, drawing back together into their co-creation of the full-spectrum white light that is at the source of everything. In those fleeting moments of intensity, it is as though the oneness, or “one source”, that underlies everything in creation is made overtly – if temporarily – visible to the eye. This is something that I found I loved to play with, not least through the theme of light streaming in through the hard-edged, man-made boundaries that are window frames, dissolving those structures away in the dazzle of light until the separation between inside and out is no longer so apparent (something which also seemed to be taking place in me as I healed). It taught me something else that proved to be so important to my own recovery; that, in order to return to this state of completeness, wholeness, unity and light, it had been entirely necessary to, first, soften and fragment or break apart until I felt scattered in pieces…just as I had watched happen in nature, time and time again. In other words, my own health “crash” had been the gift that had broken me down in order to help me reformat myself in an altogether more cohesive and inclusive way, leading to a new kind of wholeness which is so much more than, though inclusive of, physical health. My journey from a place of ‘crashed’ health towards a state of profound wellbeing fuelled such enthusiasm to share my journey with others that this blog was born in March 2011. I was then invited to publish my art-journey as an autobiographical story to be included in a best-selling series of books entitled “Adventures in Manifesting” which was published at the end of 2013. Two further blog-spaces – Light on Art and Living Whole – were created in 2015 to further specialise in the two main topics that remain closest to my heart, being “art” and “healthy and holistic living”. In the meantime, Spinning the Light continues to do what it does best – which is to flow in a very fluid and playful way through a variety of topics as they “pop up” and want to be written about. 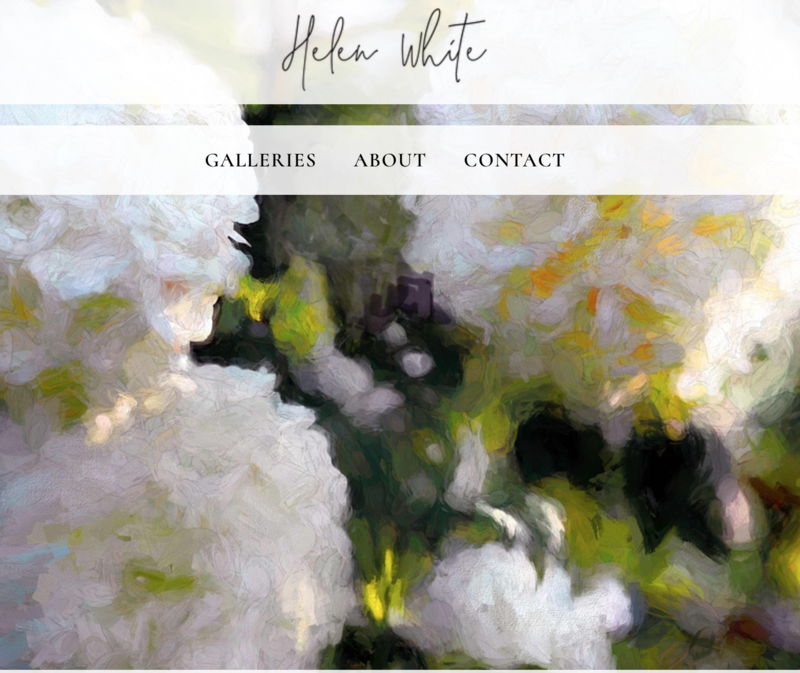 Meanwhile, the photography that underlies my painting, which can be explored at Helen White Photography, has attracted its own audience, with images published and available for licensing and prints. My digital design work has grown out of that niche; which, in turn, has turned into a prolific fabric design aspect to my business, with collections of luxury cashmere and silk clothing (such as this cashmere silk scarf, left) and home products offered via VIDA and Bags of Love. For well over a decade now, I have been based in Berkshire UK, in that little patch of rusticity that lies between Reading and Wokingham where I live in a somewhat topsy-turvey house-come-studio with my husband, daughter and Rhodesian Ridgeback, all of whom are (thankfully) tolerant of, and hugely entertained by, the many eccentricities that fuel my creativity.